COX’S BAZAR, Bangladesh (CNS) — Noor Hashem looks weak and worried as he waits in line with fellow Rohingya to see a doctor for his kidney problems at a clinic run by the international medical group Doctors Without Borders. The doctor advised him to go to a better-equipped hospital in another part of the district town for more specialized treatment. Hashem, 35, a Rohingya Muslim and high school teacher from Maungdaw in Rakhine state in nearby Myanmar, fled to Bangladesh with his wife and two daughters when the Myanmar military launched its latest crackdown on the ethnic community. 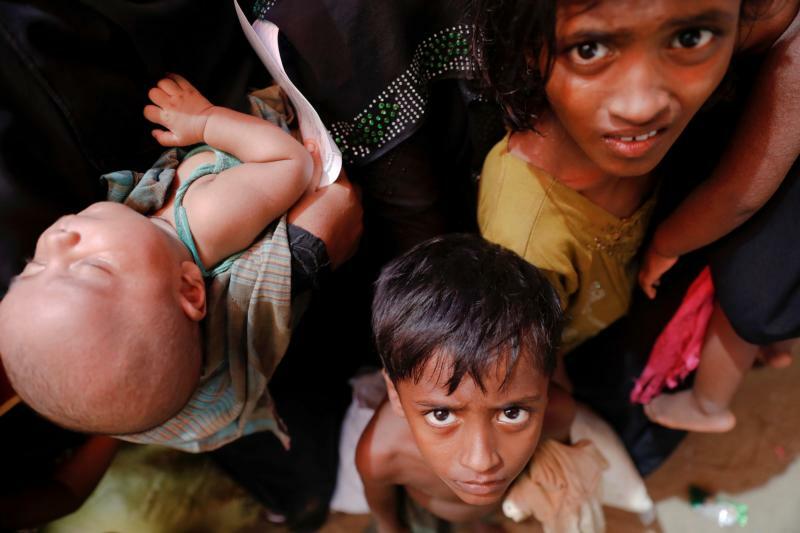 The military retaliation followed attacks on 30 security check posts Aug. 25 by militants from the Arakan Rohingya Salvation Army and has resulted in more than 1,000 Rohingya deaths, dozens of houses burned and countless women being raped. Human rights groups and the United Nations have dubbed the incidents “ethnic cleansing.” More than 420,000 Rohingya have fled across the border to Bangladesh for safety. With a bit of optimism, he nodded when asked about his reaction to Pope Francis’ visit to Myanmar Nov. 27-30 and Bangladesh Nov. 30-Dec. 2. “Pope Francis is a global icon of peace and harmony, and I know he is coming with a message of peace. I hope that his trip will have a positive impact for the Rohingya in Bangladesh, but it won’t help in Myanmar,” Hashem said. Less than 5 percent of the Rohingya know about the pope because many are illiterate and the ethnic minority community has been cut off from the rest of the world by the military and Buddhist extremists, he said. “The pope has spoken out against the plight of the Rohingya and appealed for their recognition and rights. But Myanmar won’t listen to him, because the government, the military and Buddhist radicals don’t want peace and harmony, only oppression and persecution,” Hashem said. Osman Gani, 37, fled to Bangladesh from Buthidaung, Myanmar, after soldiers burned his house in mid-September. Along with two of his brothers and a sister, they carried his elderly parents on their shoulders on a three-day journey by foot and by boat. A father of two sons and a daughter, Gani does not know what has happened to his three remaining brothers. He doubts the pope’s visit can bring a lasting solution for the Rohingya. “The pope is a humanist, and he has worked for peace in various countries. Yet, I have doubts whether he can make any difference in Myanmar’s treatment of the Rohingya as the government, military and Buddhists have no sympathy for them,” Gani told ucanews.com. Syed Alam, the imam of a mosque at Kutupalong refugee camp in Cox’s Bazar, said he is optimistic about the pope’s visit. “First of all, it is a positive sign that the pope will visit Myanmar and Bangladesh and like many of the Rohingya, I would like to pin my hopes that an influential person like the pope might foster a peaceful solution for us,” Alam said. Still, he doubted whether the pope can broker a change of fortune for the Rohingya and other ethnic and religious minorities fighting for their rights in Myanmar. “The government, the military and extremist Buddhists represent the Burmese (Bamar majority) who consider themselves superior than other communities. Unless their mindset changes, nothing will change even if the pope delivers strong messages,” Alam said. The majority of Rohingya are Muslim and a minority are Hindu. They have lived in area formerly known as Arakan, now Rakhine state, long before the Burmese occupation from 1784 to 1826 and British rule from 1826 to 1948. Yet, Myanmar does not recognize the Rohingya as one of the country’s 135 ethnic groups, considering them instead as Bengali, infiltrators from Bangladesh. In 1982, a controversial law stripped citizenship from the Rohingya, officially making them stateless. Decades of persecution by the military and extremist Buddhists forced tens of thousands to flee to various countries, mostly to Bangladesh. On several occasions, Pope Francis has spoken against mistreatment of the Rohingya in Myanmar. His most recent comments came Aug. 27, two days after the conflict flared, when he called for the violence against the ethnic Muslims to end. Even before the pope’s first-ever trip to Myanmar was announced, divisions brewed in the religiously and ethnically divided country, which has endured five decades of military rule. Despite a landslide victory of Aung San Suu Kyi as state counselor, a position akin to prime minister, in the 2015 elections and the formation of a civilian government, Myanmar’s military wields unrestrained power via the 2008 constitution it wrote, which reserves 25 percent of parliament seats for the armed forces. Myanmar’s political and religious leaders have described Pope Francis’ visit as a way to help end the country’s troubles through peacebuilding and reconciliation. However, Buddhist nationalists have been enraged over the pope’s sympathy to the stateless minority. Presumably under military pressure and dealing with political realities, the Catholic bishops of Myanmar have requested Pope Francis not to mention the term Rohingya when he visits the country. Meanwhile, in Bangladesh, Archbishop Moses M. Costa of Chittagong, which includes Cox’s Bazar, said that Pope Francis would do his best to tackle the Rohingya crisis.